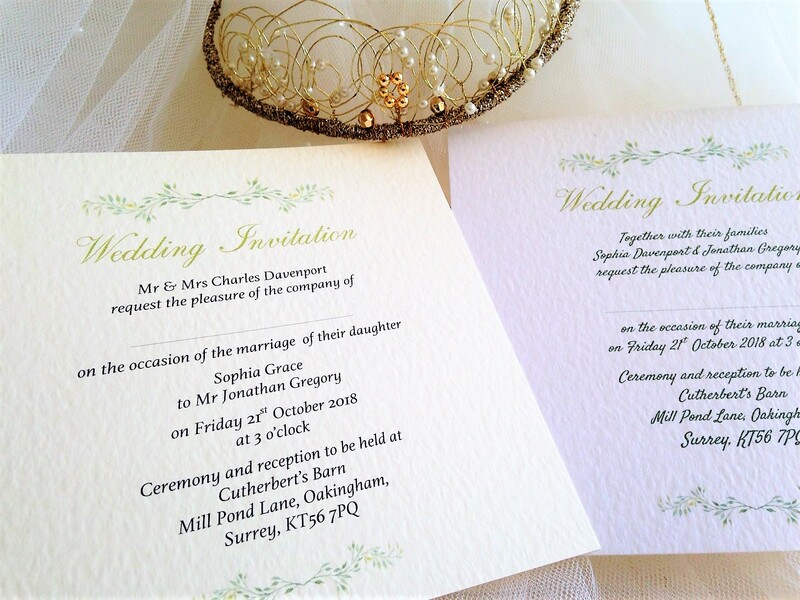 Woodland Wedding Invitations are beautiful personalised wedding invitations supplied on a thick heavy weight (270gsm) hammered card and available in either white or ivory. 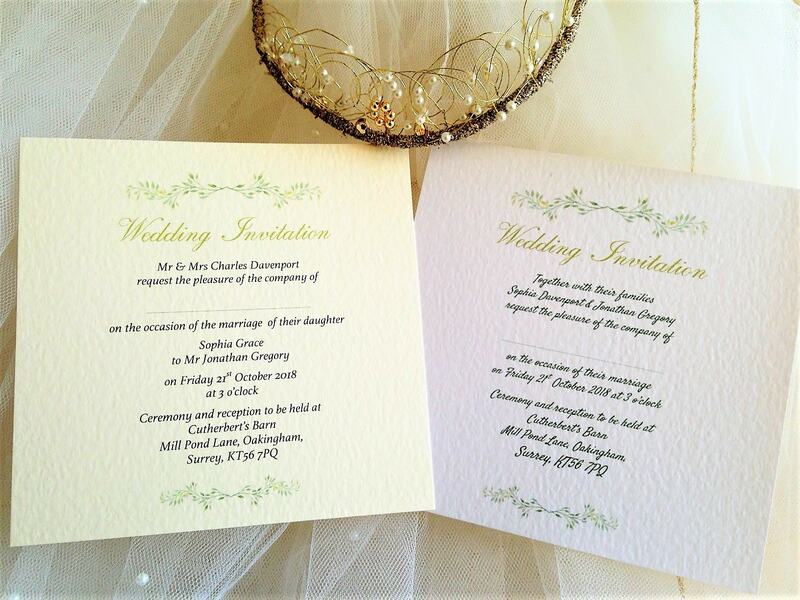 Wedding invitations are supplied with a matching hammered envelope and we can print your guests names on your invitations free of charge (this is optional). There is a good selection of font styles to choose from and we can print your wedding invitations in any colour to match a colour scheme. this clean, crisp wedding invitation design features a delicate watercolour illustration. Soft green leaves to reflect the woodland wedding or country flowers theme. 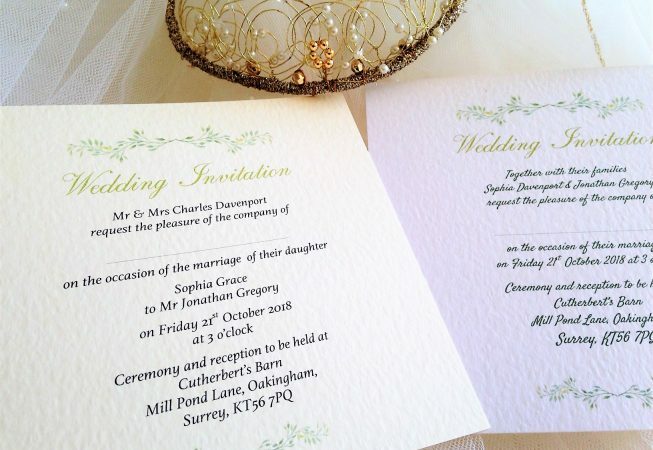 This wedding invitation design is part of our Woodland Wedding Stationery Range. We can print any wording, the examples on our website are for illustration purposes only. If you need help with your wording don’t worry. We have lots of experience and we will compose your invitations from the details you provide (no extra charge for this). Why not take us up on our free guest name printing? Alternatively if you prefer to handwrite your names then we can insert a line instead. We are able to produce wedding invites in most languages. Please contact us to discuss, some of our typeface styles are limited to particular languages. 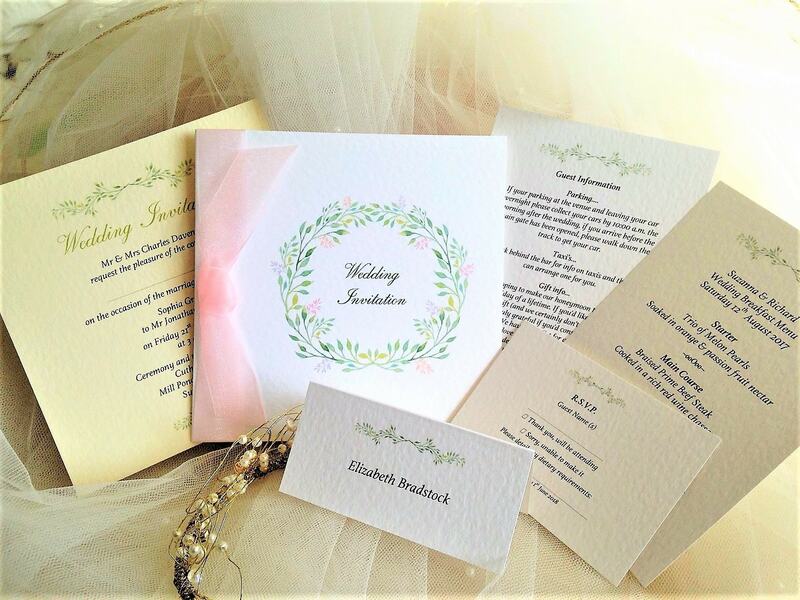 We understand it’s a busy time organising a wedding, invitations are supplied fully assembled. We have short lead times, our printing is done in house. Invitations and wedding stationery can be ordered and supplied within a short timescale, usually 3-4 days for quick delivery in the UK.